Situated near the airport, this hotel is 0.8 mi (1.2 km) from Discovery Center and within 6 mi (10 km) of Save Mart Center and California State University Fresno. Fresno Fairgrounds and Old Town Clovis are also within 6 mi (10 km). 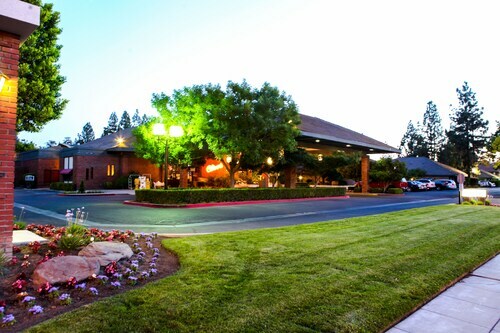 Situated in Three Rivers, this golf hotel is 1.5 mi (2.5 km) from Our Place Playground and 1.8 mi (2.9 km) from Sequoia Foothills Chamber of Commerce. Horse Creek Recreation Area and Kaweah Recreation Area are also within 9 mi (15 km). 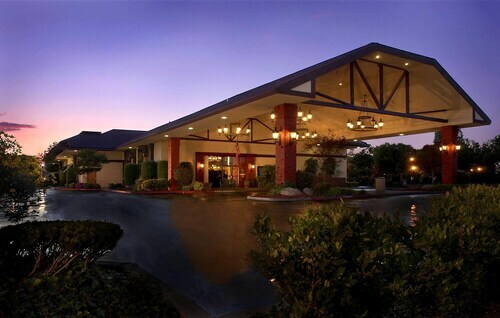 Located in Downtown, this hotel is within a 15-minute walk of Meux Home Museum and Fresno Convention Center. Chukchansi Park and Fresno Fairgrounds are also within 3 mi (5 km). Fresno Station is only a 5-minute walk. Situated in Fresno, this hotel is within 2 mi (3 km) of California State University Fresno, Vineyard Farmers Market, and Fashion Fair Mall. Fresno Philharmonic and Riverpark Shopping Center are also within 3 mi (5 km). University Square Hotel is a 10-minute walk from California State University, Fresno, and a 10-minute drive from Fresno Yosemite International Airport. There are plenty of restaurants and shops within walking distance of the hotel, and downtown Fresno is only 10 minutes away by cab. 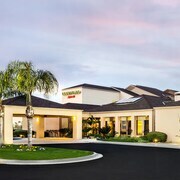 Situated in Fresno, this hotel is within 1 mi (2 km) of Fashion Fair Mall and California State University Fresno. Save Mart Center is 2.5 mi (4 km) away. 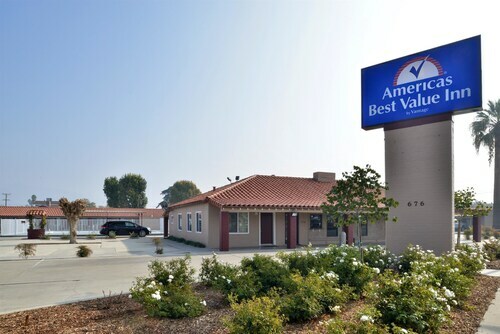 Situated in Porterville, this motel is 0.8 mi (1.3 km) from Porterville Chamber of Commerce and within 3 mi (5 km) of Porterville City Pool and Porterville Municipal Golf Course. Lindsay City Hall and McDermont Field House are also within 12 mi (20 km). 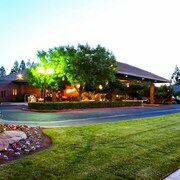 Situated in Visalia, this hotel is 0.7 mi (1.2 km) from Visalia Country Club and 2.2 mi (3.5 km) from Visalia Convention Center. Rawhide Ballpark and Visalia Adventure Park are also within 2 mi (3 km). 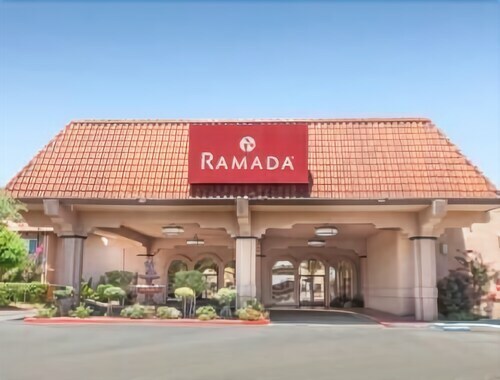 Located in the heart of Fresno, this hotel is within 3 mi (5 km) of California State University Fresno, Vineyard Farmers Market, and Fashion Fair Mall. Save Mart Center and Bulldog Stadium are also within 6 mi (10 km). 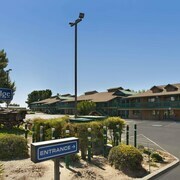 Situated in the business district, this hotel is 0.9 mi (1.4 km) from Tulare Outlet Center and within 3 mi (5 km) of Prosperity Sports Park and Tulare Historical Museum. 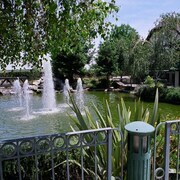 International Agri Center and Tulare Golf Course are also within 6 mi (10 km). Situated in Visalia, this golf hotel is within 6 mi (10 km) of Visalia Adventure Park, Visalia Convention Center, and Visalia Country Club. Rawhide Ballpark and Visalia City Hall are also within 6 mi (10 km). Situated on a river, this hotel is 2.5 mi (4 km) from Our Place Playground and 2.7 mi (4.4 km) from Sequoia Foothills Chamber of Commerce. Horse Creek Recreation Area and Kaweah Recreation Area are also within 6 mi (10 km). How Much is a Hotel Room in Fresno? 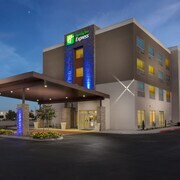 Hotels in Fresno start at $60 per night. Prices and availability subject to change. Additional terms may apply. California is often remembered in sepia-tone snapshots of glamorous red carpets, coastal boardwalks lined with surfboards, and sloping hills sprinkled with citrus groves and vineyards. You’ll find the latter landscape stretched around the city of Fresno. Although Fresno is still considered the hub of California's agricultural world, hard work and creativity have helped the city evolve into a focal point for culture and the arts, as well. Fill your own scrapbook with snapshots of the Golden State in full color—just browse our hotels in Fresno, CA and find your own niche in California’s Central Valley. With Travelocity, even the most financially careful traveler can find a great place to stay to soak up some warm rays and gorgeous scenery in captivating California. Cheap hotels in Fresno are available all over the city, with family-friendly locations and amenities sure to impress any business traveler. Though Fresno is considered the hub of California's agricultural economy, it's also a vibrant focal point for culture and the arts. Downtown's Tower District exemplifies this fact, and is home to dozens of boutiques, art galleries, and the Fresno City College. If you've got little ones with you on your trip, or are just an animal-lover yourself, be sure to check out hotels near Fresno Chaffee Zoo. 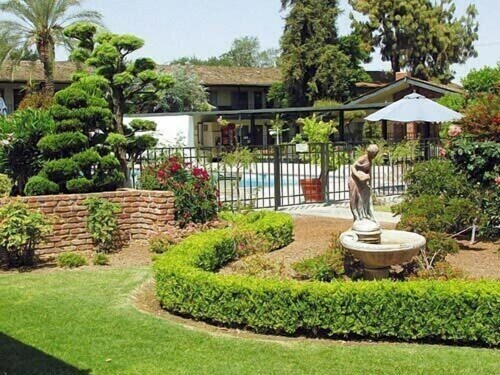 Fresno hotels in this neighborhood are a great choice all around when you want to experience the best of Fresno culture. As a hub for agriculture and other commerce, it's no surprise that Fresno loves to accommodate business travelers. 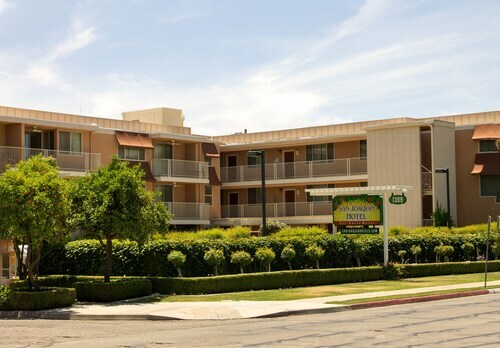 If you're looking for hotels for business in Fresno, you'll find plenty of options in the Las Palmas neighborhood and other areas along East McKinley Avenue. Best of all, if you're enjoying a long layover between plane trips, this area provides easy access to the city center and Fresno's other neighborhoods via the 180 and Fresno's public transportation network. If you're interested in spending some time relaxing outdoors, look for cheap hotels in Fresno in the northern part of the city. There, you can take in the sights at Sierra Sky Park, or spend a day in the stores at the River Park Shopping Center. 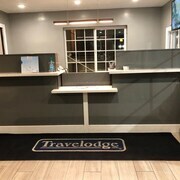 These hotels in Fresno are also a good choice if you're visiting students at the Fresno outpost of California State University, or need easy access to towns further north in the Central Valley. Whether you're looking for a resort vacation or on a business trip, Travelocity can help you choose from dozens of Fresno hotels to find and book the perfect match! The property is clean and the staff are great. I always stay here when I am in town! The hotel was convenient to what we needed to do. The staff was very friendly. The bed was comfortable, but had a room in the small tower and it is by the freeway, heard alot of freeway noise. The water pressure in the shower is horrible. The pull out mirror that you can use in the bathroom for putting on make up is in the most stupid place i have ever seen in a hotel room. On a wall, between the counter and the toilet and it doesn't even pull out far enough to use it. Should be on the wall with the light switch over the towels, near the door. Other than that, stay was very pleasant. Staff was nice, room wasn’t fancy but it was clean and cozy, breakfast was a good variety and everything tasted great! One of the hotel managers was very unpleasant and extremely rude! Liked the Breakfast that included Waffles and oranges fresh from local valleys. Liked the refurbished rooms. Liked the close proximity to Sequoia National Park. Hot Tub not hot yet. Key access to room didn't always function when should. Good location and great staff. It's a old hotel and it's feeling its age.